This card is, technically speaking, an engine – and one that generates a lot of card advantage by disrupting your opponent, at that. The downside is that there aren’t very many surveil cards right now, and not all of them are very fast against decks that are fast themselves. In that sense, it’s a good thing that surveil lends itself to finding, say, all the surveil cards in your deck, but things might get pretty scary against the more aggressive opponents. It’ll be interesting to see what else blue and black gets in the next two Ravnica sets, even off-guild cards, that might go with this. 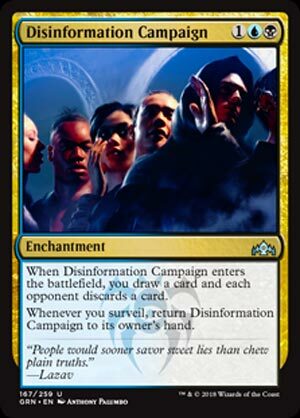 Disinformation Campaign is one of the “signpost” uncommons for the Dimir deck in Guilds of Ravnica, and it is a massive payoff for what Dimir wants to do most: surveil early and often. For the most part, this is a pretty potent swing, as you get another card and get one from their hand for a fair price. Where this gets going is if you have the ability to surveil repeatedly, bouncing this to your hand. For example, if you go from this on turn 3 into Barrier of Bones on turn 4, you can bounce this and promptly recast it to keep ripping your opponent’s hand apart. If you have enough surveil, your hand will stay full while theirs stays empty, which is a good place to be! In Limited, this is a house. I have no idea if it’ll work in Constructed; bouncing and recasting this is slow, but making sure their hand is empty is an admirable goal you can profit from.